I am so excited to be participating in the FIRST edition of "Fly on the Math Teacher's Wall". This month we are discussing place value! I will be talking about teaching place value within addition. If you are on Facebook, surely, you have seen rants about the way that math is currently taught. Seemingly elaborate diagrams are drawn to add simple numbers such as 19 + 6. Students are drawing number bonds to break apart the 6 into a 1 and a 5, are circling numbers, writing new equations. All to solve a relatively simple problem. The thing is, no one intends for our students to go through all of this to solve problems such as 19 + 6 in the future. The purpose of the activity is to use the operation of addition to teach place value, number sense and properties of operation. However, prior to grade 4, let's use the operation of addition to teach and learn as much about place value as we can! So what does a "strategy based on place value" look like and how will this benefit our children and students? Take an expression like 27 + 32 above. In the standard algorithm you would stack the numbers, add the 7 and 2 and then add the 2 and 3. You would get a result of 59 and you would be absolutely right. Is there anything wrong with this algorithm? No! ... Unless that is you were hoping to teach place value concepts. I am going to walk you through a MUCH LONGER method. The purpose of this method is NOT to teach an addition procedure that a student would be expected to use for the rest of their life. It is to take advantage of addition to teach the concept of place value in a meaningful way. First, a student would decompose 27 into 20 and 7 and 32 into 30 and 2. If you were to do 27 plus 32 in your head, it is likely that this is the first step that you might take. 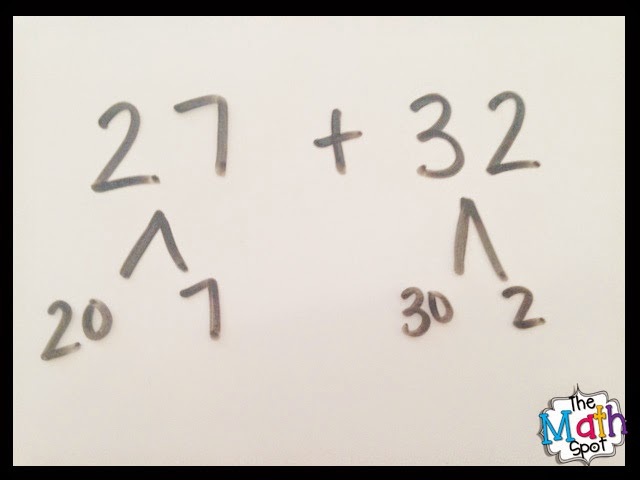 As adults, we flexibly break numbers apart so that we are able to do mental math. A child often thinks the number 27 just simply means "two seven". Next, a student would be asked to put the tens together. 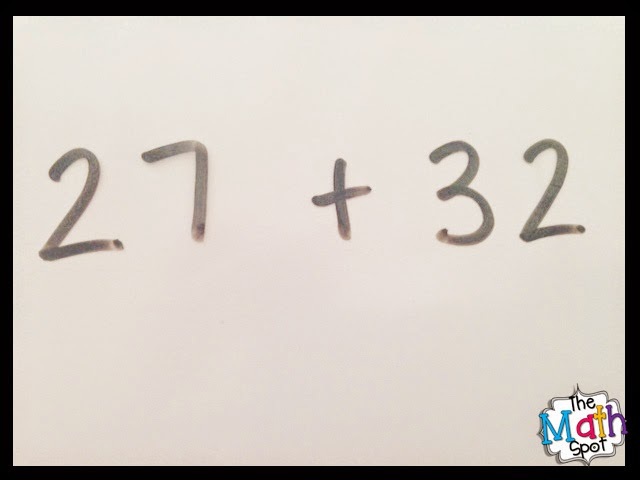 As adults, we know that 27 + 32 is the same as 20 + 30 + 7 + 2 but a student learning the traditional algorithm learns nothing about the flexibility of numbers! 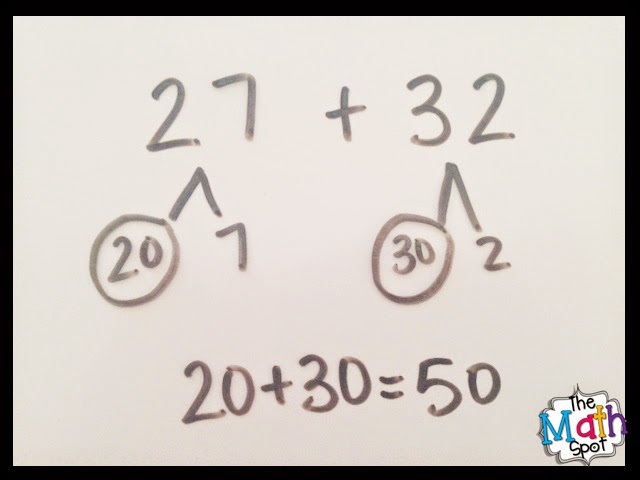 The step of putting 20 and 30 together in and of itself is a powerful step in learning about place value. 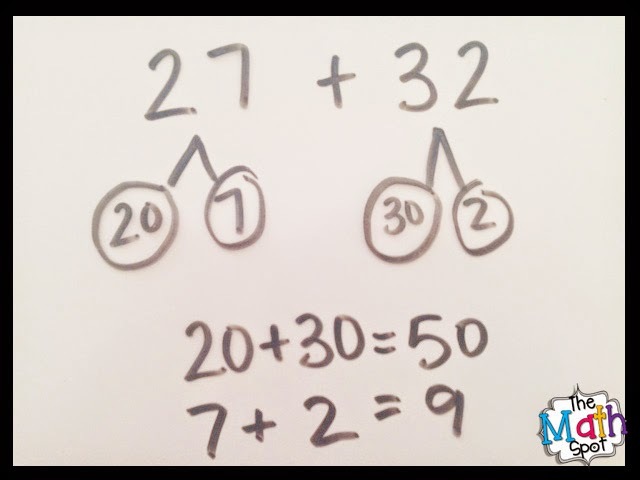 Students can see that adding 20 + 30 is really as simple as adding 2 + 3. If 20 means two tens and 30 means three tens, 20 + 30 is really just putting 2 tens and 3 tens together. 5 tens = 50. I'll remind you that I completely understand that the parent in the Facebook post above would right now be beside themselves with the above paragraph. Yes. This is A LOT more steps. Yes. There is significantly more opportunity for error in these steps. Yes. Yes. Yes. But I'm not teaching the procedure of addition. I am teaching place value concepts by USING addition. As a side note, I work with students who are struggling with the math in their classrooms. A group of 2nd grade students who had been having a lot of difficulty with place value concepts went through this activity with me. Just working up to this point (in combination with a lesson about bundling groups of tens to create new units) and my struggling students were able to calculate that 60 + 40 = 100 in their heads because 6 tens plus 4 tens = 10 tens and when you have 10 tens together you can call it 100! After adding the tens together, students combine the ones together. Lastly, students combine their group of tens and their group of ones to find their total. How many times have you seen a student add numbers vertically and fail to line the digits up correctly? This type of work lays the foundation for why it is so important to line these numbers up correctly. A student who understands place value would not make a "lining up" mistake because they would know that 5 tens plus 9 ones could never equal 140. It just wouldn't make sense! There is so much power in teaching place value through the use of operations. In the above problem you will notice that I did not deal with any regrouping. Working through a similar problem that does involve making a new ten has an additional layer of power in terms of teaching place value concepts. I hope this post has been helpful in understanding the "other side" of what we are being asked to teach and why the standards are requiring that we hold off on the standard algorithm! I would love if you would follow me on Facebook for additional tips, tricks, lesson ideas, flash freebies, and sales. Click HERE to find The Math Spot on Facebook. 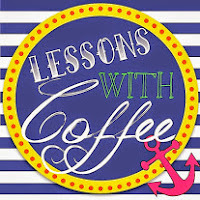 To continue the place value blog hop, click below on the icon for "Lessons with Coffee". I love this post! It would be helpful for both teachers and parents. We are in our first year with the Engage NY math curriculum and it has been an adjustment. I do love the math thinking and talk that I am hearing in my room. Do you have any other blog posts or products that support Engage NY? I teach second grade. Thanks! I am a NYS teacher as well! While I provide pull-out services for K-5, I am the math interventionist responsible for 1st and 2nd grade push-in and consult this year. While I have some products that support Engage NY materials now, I know I will be creating MANY over the course of this year! One product I am using right now is all about using base ten blocks to support place value learning http://www.teacherspayteachers.com/Product/2nd-Grade-Place-Value-with-Base-Ten-Blocks-1414478. It would fit well in terms of math stations during module 3 or as an RtI resource for your use in small groups. http://polkadotsandteachingtots.blogspot.com/2014/08/i-love-base-ten-blocks.html This post outlines the majority of the activities in that pack, however, I have just added an additional station that supports the content of place value based addition as described in this post! If you follow me on FB, I post whenever I create a new product and I often will give away flash freebies and samples as I create as well! YES! This looks like a 3rd grade lesson with NO understanding still from the majority....ugh! I know there is HOPE! Thank you for posting! 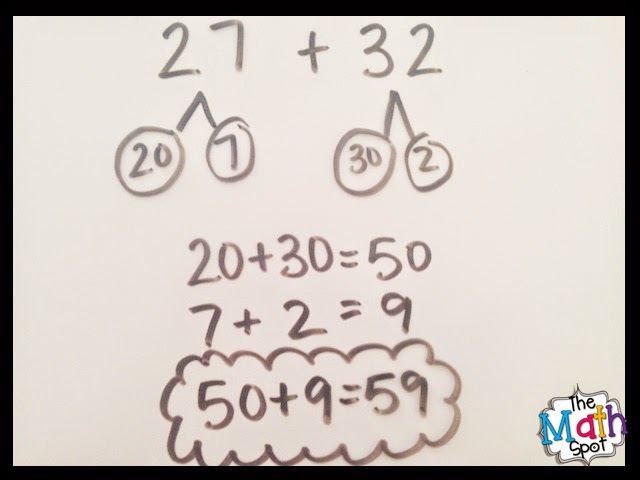 Love the tip about how we teach kids to line up the numbers properly! Using expanded firm will help with this. Thanks! How can we expect them to "line the numbers up right" if the student's don't know what the different digits really mean! Helping non-educators understand the difference between procedural understanding and conceptual understanding is so important. Thanks for reminding me that I need to be more proactive with parents. Great post! Thank you! I don't necessarily think that communicating the difference between concept and procedure within an activity- and especially in homework!- is easy to do. It's something I am certainly still working through! I love this post! It is frustrating when adults I know say things about Common Core math that just are not true. I will be sending them to check out this post! You did a great job showing the difference between conceptual understanding and memorizing a procedure. Thanks! After just completing parent-teacher conferences, I was please with the number of parents who actually commented that they wished they had learned math the way their son/daughter is learning it. One parent even commented, "It's funny how I didn't learn that way, but I think that way mentally now." 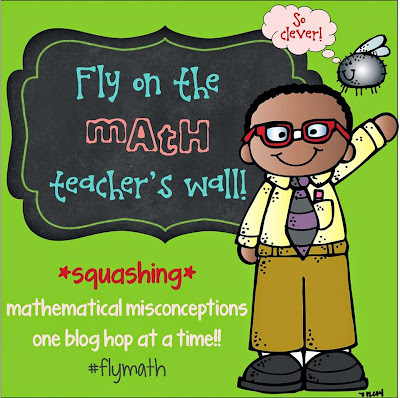 There is also such a misconception that the Common Core was not the inception of teaching math conceptually--it has been sound teaching ever since I can remember, and I have been teaching 21 years. Thanks so much for sharing this post!